UPDATED: Sat., March 31, 2018, 9:55 p.m. This story has been updated and now includes all of Saturday’s games. 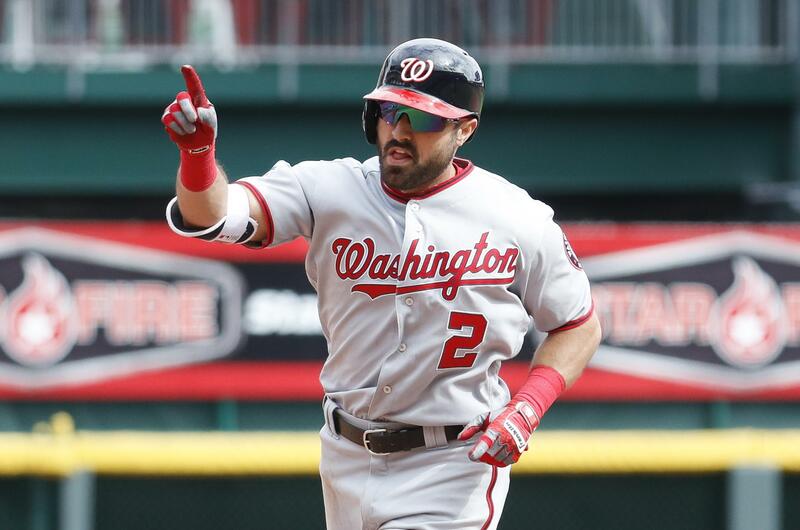 Adam Eaton had solo homer among his career-high five hits and Brian Goodwin hit his first career grand slam on Saturday, powering the Washington Nationals to a 13-7 victory over the Cincinnati Reds in Cincinnati. Stephen Strasburg gave up three runs – only one earned – in 6 1/3 innings while improving to 5-1 career against Cincinnati. Scott Schebler’s homer in the fourth inning provided Cincinnati’s first run of the season after 12 scoreless innings. The Nationals piled up six runs in six innings off Luis Castillo, the Reds’ top young starter last season. Indians 6, Mariners 5: Yonder Alonso hit his third career grand slam in the first inning, Yan Gomes added a two-run shot and Cleveland held on to defeat the Mariners in Seattle. Alonso and Gomes provided the big blows off James Paxton, who struggled with command and failed to make it out of the fifth inning. Carlos Carrasco pitched into the sixth inning to get the victory. Cody Allen got three outs for his first save. Seattle’s Ichiro Suzuki robbed Jose Ramirez of a home run leading off the third inning, timing his leap perfectly to reach above the wall in left field. Suzuki also had his first two hits for the Mariners since July 21, 2012, before he was traded to the Yankees. Cubs 10, Marlins 6 (10): Ben Zobrist hit a tiebreaking RBI single in the 10th inning and Kris Bryant followed with a three-run double, sending the Cubs to the win in Miami after Yu Darvish struggled in his first start for Chicago. Kyle Schwarber homered for the Cubs, who bounced back after a 17-inning loss to the Marlins on Friday. Pedro Strop (1-0) got the win. Darvish pitched 4 1/3 innings and was charged with five runs and five hits. He finalized a $126 million, six-year deal with Chicago in February. Derek Dietrich went deep for Miami, and Starlin Castro also drove in two runs. Brad Ziegler (0-1) got the loss. Rockies 2, Diamondbacks 1: Charlie Blackmon homered twice, helping Colorado salvage the finale of its season-opening series in Phoenix. Blackmon tied the game with a leadoff drive against Zack Greinke in the sixth inning. He added another leadoff shot against Fernando Salas (0-1) in the eighth. Bryan Shaw (1-0) pitched a scoreless seventh to get the victory. Wade Davis tossed a perfect ninth for the save in his Rockies debut. Dodgers 5, Giants 0: Kenta Maeda struck out 10 over five innings, and Los Angeles finally found enough offense to beat San Francisco in Los Angeles. After striking out 18 times in a pair of 1-0 defeats to open the season, the Dodgers got the loudest cheers in the first inning for a sacrifice fly by Yasiel Puig that scored their first run off Derek Holland (0-1). Matt Kemp followed with an RBI single to make it 2-0. Maeda (1-0) allowed five hits and walked one. He faced base runners in every inning except the fifth. Brewers 7, Padres 3: Christian Yelich tied his career high with five hits, leading Milwaukee to a sweep of an season-opening series in San Diego. Yelich scored three times and drove in two runs as Milwaukee improved to 3-0 for the first time since it won its first five games in 2006. Lorenzo Cain had three hits and two RBIs, and Travis Shaw drove in three runs. Brewers left-hander Brent Suter went five innings, allowing three runs and three hits. Freddy Galvis hit a two-run homer for San Diego, and Luis Perdomo allowed five runs and seven hits in four innings. Blue Jays 5, Yankees 3: Yangervis Solarte hit a tiebreaking homer in the eighth inning of Toronto’s first win of the season, and Kevin Pillar added an insurance run by stealing second, third and home in Toronto’s victory over New York in Toronto. Solarte began the eighth with a deep drive to center off Dellin Betances for a 4-3 lead. Pillar hit a one-out single and swiped his way to third. The speedy outfielder then broke for the plate with Gift Ngoepe at bat, and Betances threw wildly to the backstop. It was Toronto’s first straight steal of home since Aaron Hill did it against New York on May 29, 2007. Ryan Tepera pitched one inning for the win and Roberto Osuna finished for his first save. Twins 6, Orioles 2: Minnesota right-hander Kyle Gibson pitched six hitless innings before being replaced by Ryan Pressly, who kept the no-hitter intact until the eighth, and the Twins went on to defeat the Orioles in Baltimore. Gibson, Pressly and Gabriel Moya combined on a three-hitter to help Minnesota bounce back from an 11-inning, season-opening loss to Baltimore on Thursday. Miguel Sano, Jason Castro and Max Kepler homered against Baltimore right-hander Andrew Cashner, who took the loss. Astros 9, Rangers 3: Lance McCullers Jr. struck out 10 in 5 1/3 innings and Carlos Correa hit a two-run homer, leading Houston to the victory over Texas in Arlington, Texas. Correa and A.L. MVP Jose Altuve each had four hits and scored twice for the World Series champions. Jake Marisnick hit a two-run drive, and Marwin Gonzalez also drove in two runs. Elvis Andrus had two hits for Texas, including his first homer of the season. He scored each of the Rangers’ three runs. Losing pitcher Matt Moore allowed four runs and seven hits in four innings in his Texas debut. Red Sox 3, Rays 2: Xander Bogaerts homered for Boston, and Rick Porcello carried a shutout into the sixth inning as Boston defeated Tampa Bay in St. Petersburg, Florida. Bogaerts hit a solo drive in the second against Andrew Kittredge, a reliever making his first big league start in the debut of Tampa Bay’s plan to use bullpen days in place of a customary fifth starter. Porcello was charged with one run and six hits in 5 1/3 innings. Craig Kimbrel worked the ninth for his second save. Mets 6, Cardinals 2: Yoenis Cespedes and Travis d’Arnaud homered, Todd Frazier drove in three runs and the Mets opened at 2-0 for the first time since 2013, defeating St. Louis in New York. D’Arnaud connected in the fourth and Cespedes made it 4-1 with another solo drive in the fifth. Matt Carpenter homered for St. Louis in the eighth. Michael Wacha allowed four runs in 4 2/3 innings and took the loss. Angels 8, Athletics 3: Mike Trout had three hits and two RBIs, Zack Cozart also drove in two runs and Los Angeles finished with 12 hits in defeating the Athletics in Oakland, California. Angels right-hander Matt Shoemaker, the winning pitcher, gave up three runs and four hits in 5 2/3 innings. He struck out four and walked four while improving to 5-0 with a 2.38 ERA in his last seven starts against Oakland. A’s starter Daniel Mengden was charged with six runs, five earned, and seven hits in 5 2/3 innings. He also threw two wild pitches. Braves 15, Phillies 2: Ender Inciarte drove in four runs with three hits, Ryan Flaherty had four hits and scored four times, and Atlanta roughed up Vince Velasquez to defeat Philadelphia in Atlanta. Brandon McCarthy allowed two runs in 5 1/3 innings in his Braves debut. Velasquez faltered in a tough spot for Philadelphia after it used a combined 13 relievers in the first two games of the series. He was charged with seven runs, four earned, and nine hits in 2 2/3 innings. Six Phillies pitchers allowed 19 hits, and the defense committed four errors. After the game, the Braves added catching depth by acquiring Carlos Perez from the Los Angeles Angels in exchange for infielder Ryan Schimpf. The Braves needed help at catcher after they placed Tyler Flowers on the 10-day disabled list with an oblique injury on Friday and Kurt Suzuki suffered a bruised right hand Friday night. Chris Stewart started Saturday night’s game. White Sox 4, Royals 3: Welington Castillo hit a two-run double with two outs in the eighth inning, lifting Chicago over the Royals in Kansas City, Missouri. Danny Farquhar pitched a scoreless inning for the win. Former Royals reliever Joakim Soria got Whit Merrifield to fly out with runners on first and second for his first save with the White Sox. Chicago’s rally began when Yoan Moncada hit a towering home run off Brandon Maurer to begin the eighth. Avisail Garcia followed with a single, Jose Abreu grounded into a fielder’s choice and Matt Davidson drew a walk before Castillo’s two-run liner to right put the White Sox in front. Published: March 31, 2018, 7:45 p.m. Updated: March 31, 2018, 9:55 p.m.